Please copy and paste ' [[Category:Shrimp (Saltwater)]] ' into the end of your article to include it in this category. Shrimp make interesting and colourful additions to an invertebrate or reef aquarium. Most Shrimp are scavengers that will eagerly accept small pieces of fish or shrimp in the home aquarium. Shrimp have a hard outer shell (carapace) that must be shed (moulted) for the shrimp to grow. They vary in temperament from exceptionally peaceful such as the Saran Shrimp to notorious predators like the Mantis Shrimp. 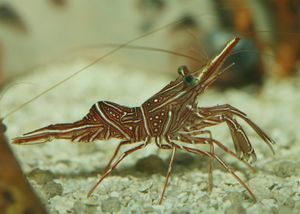 Research should be done carefully of which shrimp would be suitable for your marine tank. Pages in category "Shrimp (Saltwater)"
The following 33 pages are in this category, out of 63 total. Media in category "Shrimp (Saltwater)"
The following 10 files are in this category, out of 17 total. This page was last edited on 17 August 2010, at 11:47.